The Wireless LAN Certified Training Programm (WLAN-CTP) has been developed to be a structured knowledge transfer, based on the standards of IEEE 802.11 and using the latest solutions on the market. After having passed the certification exams, the Wireless LAN Expert a developer, administrator or analyst, will be able to monitor, manage, troubleshoot existing Wireless LAN networks and will keep them on the highest security level possible. The complicity of the continuative Wireless LAN services, which are more and more used in connection with Wireless LAN technologies, need a training concept, which enables IT-deciders and planners to analyse the actual knowledge of Wireless LAN service personnel and IT professionals in view of the always raising needs of the IT world and applications of the international industrial regulations. Nowadays, the Wireless LAN infrastructure assumes, that the IT professionals not only obtained the know-how based on the 802.11 standard, but also are able to master the applied vendor dependent solutions and concepts. Therefore the equipment of numerous well known vendors are placed for practice at the participants disposal. Our training concept not only imparts the knowledge of Wireless LAN technologies, based on the IEEE 802.11 standard, but also the continuative vendor dependent solutions and concepts, which are currently available on the market. 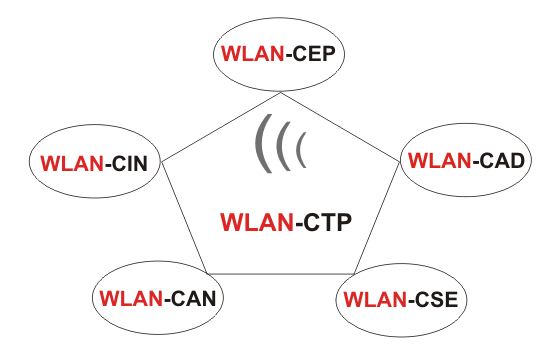 The WLAN-CTP program offers the advantage, that all aspects of the Wireless networks in a row of courses are tought. The quantity and quality of information of this progam is useful for beginners as well as experts. Since many different levels are available, the participants can adopt as much knowledge concerning Wireless networks, as required and needed.